THIS WEB SITE LOCATED AT WWW.GOLFSHOESONLY.COM IS PROVIDED TO YOU BY GLOBAL VALUE COMMERCE, INC. (“GVC”). PLEASE READ THESE TERMS AND CONDITIONS CAREFULLY BEFORE USING THIS WEB SITE LOCATED AT WWW.GOLFSHOESONLY.COM. YOUR USE OF THIS WEB SITE CONFIRMS YOUR UNCONDITIONAL ACCEPTANCE OF THE FOLLOWING TERMS AND CONDITIONS. IF YOU DO NOT ACCEPT THESE TERMS AND CONDITIONS, DO NOT USE THIS WEB SITE. 3. Orders for Products and Services. We make products and certain services available to visitors and registrants of this website. If you order any products or services, you hereby represent and warrant that you are 18 years old or older. You agree to pay in full the prices for any purchases you make either by credit/debit card concurrent with your online order or by other payment means acceptable to Golf Shoes Only, LLC. You agree to pay all applicable taxes. If payment is not received by us from your credit or debit card issuer or its agents, you agree to pay all amounts due upon demand by us. Certain products that you purchase and/or download on or through the website may be subject to additional terms and conditions presented to you at the time of such purchase. 4. Use of this Web Site. The Web Site design and all text, graphics, information, content, and other material displayed on or that can be downloaded from this Web Site are either the property of, or used with permission by, GVC and are protected by copyright, trademark and other laws and may not be used except as permitted in these Terms and Conditions or with the prior written permission of the owner of such material. You may not modify the information or materials located on this Web Site in any way or reproduce or publicly display, perform, or distribute or otherwise use any such materials for any public or commercial purpose. Any unauthorized use of any such information or materials may violate copyright laws, trademark laws, laws of privacy and publicity, and other laws and regulations. You are responsible for maintaining the confidentiality of your account information and password and for restricting access to such information and to your computer. You agree to accept responsibility for all activities that occur under your account or password. 5. Prohibited User Conduct. You warrant and agree that, while using the website and the various services and features offered on or through the website, you shall not: (a) impersonate any person or entity or misrepresent your affiliation with any other person or entity; (b) insert your own or a third party's advertising, branding or other promotional content into any of the website's content, materials or services, or use, redistribute, republish or exploit such content or service for any further commercial or promotional purposes; or (c) attempt to gain unauthorized access to other computer systems through the website. You shall not: (i) engage in spidering, "screen scraping," "database scraping," harvesting of e-mail addresses, wireless addresses or other contact or personal information, or any other automatic means of obtaining lists of users or other information from or through the website or the services offered on or through the website, including without limitation any information residing on any server or database connected to the website or the services offered on or through the website; (ii) obtain or attempt to obtain unauthorized access to computer systems, materials or information through any means; (iii) use the website or the services made available on or through the website in any manner with the intent to interrupt, damage, disable, overburden, or impair the website or such services, including, without limitation, sending mass unsolicited messages or "flooding" servers with requests; (iv) use the website or the website's services or features in violation of the intellectual property or other proprietary or legal rights of Golf Shoes Only, LLC or any third party; or (v) use the website or the website's services in violation of any applicable law. You further agree that you shall not attempt (or encourage or support anyone else's attempt) to circumvent, reverse engineer, decrypt, or otherwise alter or interfere with the website or the website's services, or any content thereof, or make any unauthorized use thereof. You agree that you shall not use the website in any manner that could damage, disable, overburden, or impair the website or interfere with any other party's use and enjoyment of the website or any of its services. You shall not obtain or attempt to obtain any materials or information through any means not intentionally made publicly available or provided for through this website. 6. Trademarks. Certain trademarks, trade names, service marks and logos used or displayed on this Web Site are registered and unregistered trademarks, trade names and service marks of GVC. Other trademarks, trade names and service marks used or displayed on this Web Site are the registered and unregistered trademarks, trade names and service marks of their respective owners. Nothing contained on this Web Site grants or should be construed as granting, by implication, estoppel, or otherwise, any license or right to use any trademarks, trade names, service marks or logos displayed on this Web Site without the written permission of GVC or such third party owner. 7. Third Party Links. From time to time, this Web Site may contain links to Web sites that are not owned, operated or controlled by GVC. All such links are provided solely as a convenience to you. If you use these links, you will leave this Web Site. GVC is not responsible for any content, materials or other information located on or accessible from any other Web site. GVC does not endorse, guarantee, or make any representations or warranties regarding any other Web site, or any content, materials or other information located or accessible from such Web sites, or the results that you may obtain from using such Web sites. If you decide to access any other Web site linked to or from this Web Site, you do so entirely at your own risk. 9. DISCLAIMERS. YOUR USE OF THIS SITE IS AT YOUR RISK. THE MATERIALS AND SERVICES PROVIDED IN CONNECTION WITH THIS WEB SITE ARE PROVIDED "AS IS" WITHOUT ANY WARRANTIES OF ANY KIND INCLUDING WARRANTIES OF MERCHANTABILITY, FITNESS FOR A PARTICULAR PURPOSE, OR NON-INFRINGEMENT OF INTELLECTUAL PROPERTY. GVC DOES NOT WARRANT THE ACCURACY OR COMPLETENESS OF THE MATERIALS OR SERVICES ON OR THROUGH THIS WEB SITE. THE MATERIALS AND SERVICES ON OR THROUGH THIS WEB SITE MAY BE OUT OF DATE, AND GVC DOES NOT MAKE ANY COMMITMENT OR ASSUME ANY DUTY TO UPDATE SUCH MATERIALS OR SERVICES. THE FOREGOING EXCLUSIONS OF IMPLIED WARRANTIES DO NOT APPLY TO THE EXTENT PROHIBITED BY LAW. PLEASE REFER TO YOUR LOCAL LAWS FOR ANY SUCH PROHIBITIONS. ALL PRODUCTS AND SERVICES PURCHASED ON OR THROUGH THIS WEB SITE ARE SUBJECT ONLY TO ANY APPLICABLE WARRANTIES OF THEIR RESPECTIVE MANUFACTURES, DISTRIBUTORS AND SUPPLIERS, IF ANY. TO THE FULLEST EXTENT PERMISSIBLE BY APPLICABLE LAW, GVC HEREBY DISCLAIMS ALL WARRANTIES OF ANY KIND, EITHER EXPRESS OR IMPLIED, INCLUDING, ANY IMPLIED WARRANTIES WITH RESPECT TO THE PRODUCTS AND SERVICES LISTED OR PURCHASED ON OR THROUGH THIS WEB SITE. WITHOUT LIMITING THE GENERALITY OF THE FOREGOING, GVC HEREBY EXPRESSLY DISCLAIMS ALL LIABILITY FOR PRODUCT DEFECT OR FAILURE, CLAIMS THAT ARE DUE TO NORMAL WEAR, PRODUCT MISUSE, ABUSE, PRODUCT MODIFICATION, IMPROPER PRODUCT SELECTION, NON-COMPLIANCE WITH ANY CODES, OR MISAPPROPRIATION. GVC MAKES NO WARRANTIES TO THOSE DEFINED AS "CONSUMERS" IN THE MAGNUSON-MOSS WARRANTY-FEDERAL TRADE COMMISSION IMPROVEMENTS ACT. THE FOREGOING EXCLUSIONS OF IMPLIED WARRANTIES DO NOT APPLY TO THE EXTENT PROHIBITED BY LAW. PLEASE REFER TO YOUR LOCAL LAWS FOR ANY SUCH PROHIBITIONS. 10. LIMITATIONS OF LIABILITY. GVC does not assume any responsibility, and shall not be liable for, any damages to, or viruses that may infect, your computer, telecommunication equipment, or other property caused by or arising from your access to, use of, or browsing this Web Site or your downloading of any materials, from this Web Site. IN NO EVENT WILL GVC, ITS OFFICERS, DIRECTORS, EMPLOYEES, SHAREHOLDERS, AFFILIATES, AGENTS, SUCCESSORS, ASSIGNS, RETAIL PARTNERS NOR ANY PARTY INVOLVED IN THE CREATION, PRODUCTION OR TRANSMISSION OF THIS WEB SITE BE LIABLE TO ANY PARTY FOR ANY INDIRECT, SPECIAL, PUNITIVE, INCIDENTAL OR CONSEQUENTIAL DAMAGES (INCLUDING, WITHOUT LIMITATION, THOSE RESULTING FROM LOST PROFITS, LOST DATA OR BUSINESS INTERRUPTION) ARISING OUT OF THE USE, INABILITY TO USE, OR THE RESULTS OF USE OF THIS WEB SITE, ANY WEB SITES LINKED TO THIS WEB SITE, OR THE MATERIALS, INFORMATION OR SERVICES CONTAINED AT ANY OR ALL SUCH SITES, WHETHER BASED ON WARRANTY, CONTRACT, TORT OR ANY OTHER LEGAL THEORY AND WHETHER OR NOT ADVISED OF THE POSSIBILITY OF SUCH DAMAGES. THE FOREGOING LIMITATIONS OF LIABILITY DO NOT APPLY TO THE EXTENT PROHIBITED BY LAW. PLEASE REFER TO YOUR LOCAL LAWS FOR ANY SUCH PROHIBITIONS. IN THE EVENT OF ANY PROBLEM WITH THIS WEB SITE OR ANY CONTENT, YOU AGREE THAT YOUR SOLE REMEDY IS TO CEASE USING THIS WEB SITE. IN THE EVENT OF ANY PROBLEM WITH THE PRODUCTS OR SERVICES THAT YOU HAVE PURCHASED ON OR THROUGH THIS WEB SITE, YOU AGREE THAT YOUR SOLE REMEDY, IF ANY, IS FROM THE MANUFACTURER OF SUCH PRODUCTS OR SUPPLIER OF SUCH SERVICES, IN ACCORDANCE WITH SUCH MANUFACTURER'S OR SUPPLIER'S WARRANTY, OR TO SEEK A RETURN AND REFUND FOR SUCH PRODUCT OR SERVICES IN ACCORDANCE WITH THE RETURNS AND REFUNDS POLICIES POSTED ON THIS WEB SITE. 11. Photosensitive seizures. A small percentage of users may experience a seizure when exposed to certain visual images, such as flashing lights or patterns that may appear in video games or other electronic or online content. Individuals who have no history of seizures or epilepsy may have an undiagnosed condition that can cause these "photosensitive epileptic seizures" while watching video games or other electronic content. These seizures have a variety of symptoms, including lightheadedness, disorientation, confusion, momentary loss of awareness, eye or face twitching, altered vision or jerking or shaking of arms or legs. If you experience any of the foregoing symptoms, or if you or your family has a history of seizures or epilepsy, you should immediately stop using the website and consult a doctor. 12. Revisions to these Terms and Conditions. GVC may revise these Terms and Conditions at any time and from time to time by updating this posting. You should visit this page from time to time to review the then current Terms and Conditions because they are binding on you. Certain provisions of these Terms and Conditions may be superseded by expressly designated legal notices or terms located on particular pages at this Web Site. 13. Choice of Law; Jurisdiction. These Terms and Conditions supersede any other agreement between you and GVC to the extent necessary to resolve any inconsistency or ambiguity between them. This Web Site is administered by GVC from its offices in North Carolina. These Terms and Conditions will be governed by and construed in accordance with the laws of the State of North Carolina, without giving effect to any principles of conflicts of laws. Any action seeking legal or equitable relief arising out of or relating to this Web Site shall be brought only in the State and Federal courts located in Wake County, State of North Carolina. A printed version of these Terms and Conditions shall be admissible in judicial and administrative proceedings based upon or relating to these Terms and Conditions to the same extent and subject to the same conditions as other business documents and records originally generated and maintained in printed form. 14. Termination. You or GVC may suspend or terminate your account or your use of this Web Site at any time, for any reason or for no reason. You are personally liable for any orders that you place or charges that you incur prior to termination. GVC reserves the right to change, suspend, or discontinue all or any aspect of this Web Site at any time without notice. 15. Risk of Loss. 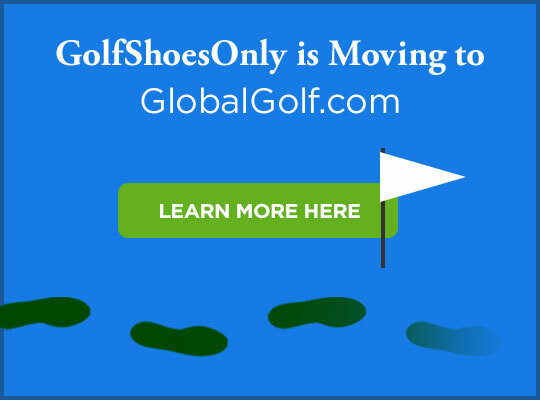 All items purchased from WWW.GOLFSHOESONLY.COM are made pursuant to a shipment contract. This means that the risk of loss and title for such items pass to you upon our delivery to the carrier. 16. Licensed Technologies. This site provides faceted search licensed by Kelora Systems, LLC (www.kelora.com), under U.S. Patent 6,275,821. 17. State Sales and Use Tax Reporting. In compliance with various state sales tax laws, we collect sales tax for those states that require it based on either physical or economic nexus laws. Based on the ship-to address you specify in your order, we currently collect and remit sales taxes in North Carolina, Massachusetts and Utah (states in which we have physical nexus) and Alabama, California, Colorado, Connecticut, Hawaii, Illinois, Indiana, Kentucky, Maine, Maryland, Michigan, Minnesota, Mississippi, Nevada, New Jersey, North Dakota, Ohio, Oklahoma, Pennsylvania, Rhode Island, South Carolina, South Dakota, Tennessee, Vermont, Washington, Wisconsin, and Wyoming (states in which we have economic nexus). If we are shipping your order to any of these states, the appropriate sales taxes will be added to your order total in accordance with state and local sales tax laws and such taxes displayed in the shopping cart and on your final order confirmation.